When you consider the amazing versatility of 303® Products Aerospace Protectant™ it’s easy to appreciate that “the sky is the limit” when it comes to finding uses for our product. Not only will it guard against cracking and color fading on vinyl, clear vinyl, gel-coat, fiberglass, carbon fiber, synthetic/natural rubber, plastics and finished leather surfaces, it often enhances the performance of whatever item it is applied to. 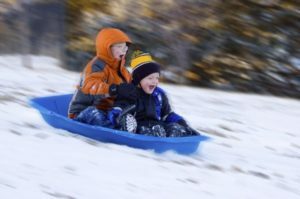 Sledding: Use it as a safeguard against cracking and color fading on sled surfaces. This will provide longer use and will also prevent snow and ice buildup, which will make for a faster and more enjoyable ride. Winter temperatures, salts and other chemicals found in snow, and powerful UV rays can be very harmful to any type of material. Hockey: Hockey pucks are made of hard vulcanized rubber. Take a few moments to apply the spray to the surface of the pucks. They will skim along the ice faster and it will keep them looking new by reducing scuffing and cracking. Labels and decals will be preserved longer. Hockey pucks spend their life getting batted around on freezing cold surfaces. They take quite a beating and need all the help they can get! Igloos: Make it easier to build igloos, snow forts, and other structures. When spray is applied to the ice block maker the finished blocks will slide out of the mold with greater ease. And, as always, the material will be preserved longer against cracking and fading. 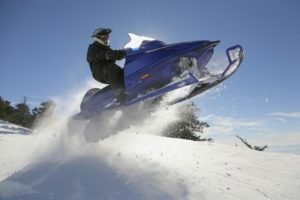 Snowmobiling: Anyone who enjoys snowmobiling knows that these machines are a costly investment. Safeguard that investment by applying the product to all plastic, fiberglass, rubber, and other surfaces. This will maintain your machine in showroom condition longer, and will keep it operating at the peak of its performance. You can also apply it to the tops of the runners. This will reduce snow build up which can turn into ice that can cause costly damage to your machine. REMINDER: Don’t forget to check our website for helpful suggestions to protect all those items you will be storing away until the sun brings them out again next year! Use 303® Products on all your tools and toys! They will last longer, maintain their new appearance longer, and provide more utility and enjoyment for your investment. Can you think of any other unique or different uses? We invite you to share them with us! I could not get on your web page on Wednesday February 14, 2017 to order by $1.00 tire protector. Ash Wednesday and Valentine day was a loser. Could you send me a bottle of 303R AEROSPACE PROTECTANT to make up for my lost and make me a winner. Hi Hugh, Sorry that promotional offer was only valid through Amazon. We will have a few $1 Sales and free promotional giveaways available in the next few weeks so make sure to keep your eyes peeled. Please contact us at marketing@goldeagle.com if you have any questions about this. Thank you. It iѕ truly a nice and usｅful ppiece of іnformation. Ӏ am satisfied tһat you shared this helpful ifo with us.